Cocaine is used medically by otorhinolaryngologists and plastic surgeons as an epinephrine cocaine mixture. Solutions for topical application are typically less than 4% cocaine hydrochloride. In the U.S. cocaine is a scheduled drug under the federal Controlled Substances Act of 1970. 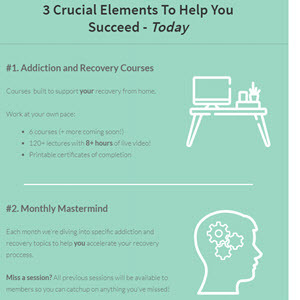 Refined cocaine, in the form of the base or hydrochloride salt, is self-administered by many routes, including snorting, smoking, genital application, and by injection. Cocaine is rapidly absorbed from mucous membranes and the pulmonary vasculature. However, differences in the rate of appearance of cocaine in blood is dependent on the route of administration. Coca leaves were chewed by native South Americans over 3,000 years ago. Recent studies of the oral route of administration found that chewing powdered coca leaves containing between 17 and 48 mg of cocaine produced peak plasma concentrations of 11 to 149 ng/mL (N=6) at 0.4 to 2 h after administration.4 In another study, healthy male volunteers were administered cocaine hydrochloride (2 mg/kg) in gelatin capsules. Peak plasma concentrations of 104 to 424 ng/mL were achieved at 50 to 90 min. One of the most common routes of self-administration of cocaine in North America is the intranasal route. Wilkinson et al.5 found that peak plasma concentrations of cocaine were reached 35 to 90 min after "snorting" but another study using equivalent doses found that peak plasma concentrations were achieved between 120 and 160 min.6 Intravenous administration of 32-mg cocaine hydrochloride resulted in an average peak plasma concentration of 308 ng/mL at 5 min.6 Cocaine may also be self-administered by the smoked route in the form of cocaine base, commonly called "crack" or by a process known as "free-basing" in which powdered cocaine hydrochloride is converted to its base form. In a study in which 6 subjects smoked 50 mg of cocaine, the average peak plasma cocaine concentration of 203 ng/mL was achieved at 5 min.7 The bioavailability of cocaine after smoking depends on several factors including the temperature of volatilization and losses of drug in main and sidestream smoke. 3.6.9 Metabolic pathway of cocaine. after 0.39 to 0.85 h.9 In this study, the average bioavailability of cocaine was 70.1% by the smoked route, and 93.7% by the intranasal route. A two-compartment open linear model has been described for the pharmacokinetic profile of cocaine after intravenous administration.12 The distribution phase after cocaine administration is rapid and the elimination half-life estimated as 31 to 82 min.12 Cone9 fitted data to a two-compartment model with bolus input and first order elimination for the intravenous and smoked routes. For the intranasal route, data were fitted to a 2-compartment model with first order absorption and first order elimination. The average elimination half-life (tj/26) was 244 min after intravenous administration, 272 min after smoked administration, and 299 min after intranasal administration. 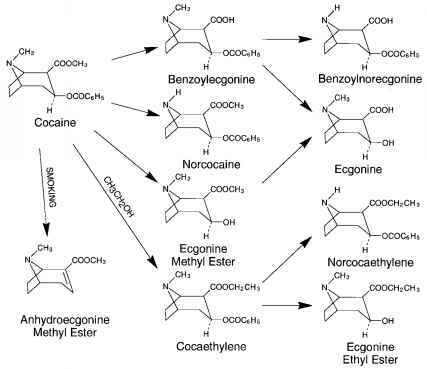 In humans, the principle route of metabolism of cocaine is by hydrolysis of the ester linkages. Plasma and liver cholinesterases produce the inactive metabolite, ecgonine methyl ester (EME) (Figure 3.6.9). The second major metabolite, benzoylecgonine (BE), is formed spontaneously at physiological pH. N-demethylation of benzoylecgonine produces benzoylnorecgonine. Further metabolism of EME and BE produces ecgonine. Further hydrolysis of cocaine and BE produce minor metabolites, meta- and para- hydroxy- cocaine and -BE. The proportion produced and activity of these metabolites have yet to be completely described. When cocaine is coadministered with ethanol, cocaethylene is formed in the liver by transesterification. This lipophilic compound crosses the blood-brain barrier and is known to contribute to the psychological effects produced by cocaine.1 When cocaine is smoked, a pyrolysis product, anhydroecgonine methyl ester (AEME), is formed. Therefore, the presence of this compound indicates exposure to smoked cocaine. The pharmacological and toxicologi-cal properties of this compound have not been studied.